Since the last post on the completion of tracklaying in the storage yards, I have been gapping all the PCB sleepers and checking for shorts across the rails. This is quite a tedious process, but a necessity, as obviously there cannot be ANY short circuits present. I have also commenced installation of the point blades and Cobalt motors. Some years ago when I first started looking at handbuilt turnouts, I bought some tools from Fast Tracks, namely for filing up vee crossings (frogs) and point blades. Now, like Andrew said in a post on Bowen Creek blog back in June 2010, I am buggered if I could accurately file up correct looking point blades with their tool. For starters, their tool does not create the correct profile of a point blade. It is the easy way out of making a blade without having to know how the real one looks and works. They might be OK for RP25 profile wheels but not for P87 wheels and near prototype modelling. 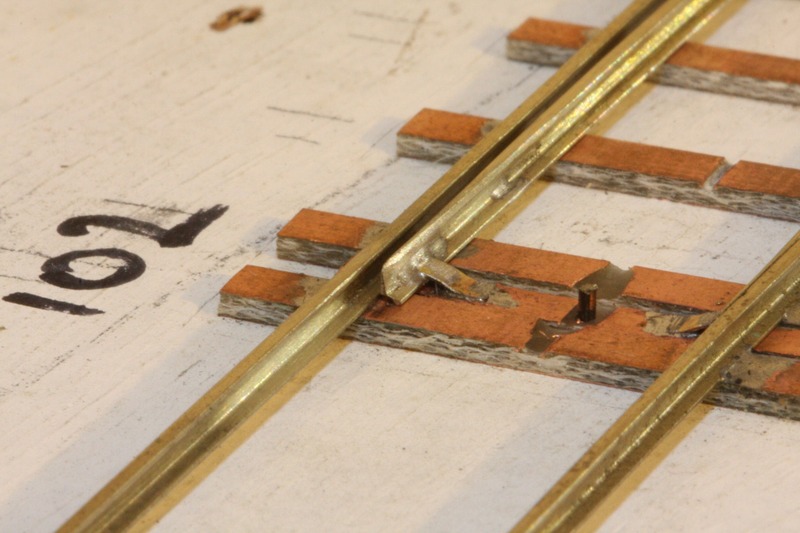 Plus there was the added task of filing away the base of the stock rail with a very un-prototypical notch to accommodate these blades. Anyway, I totally agree with Andrew’s comment in his post. So, as Andrew also mentions, I sourced some correctly CNC machined 3-way planed code 70 point blades from Proto87 Stores in the US. See here for a brief description of them on the Stores site. Go about halfway down the page and look for the PROTOTYPE POINTS heading. These blades, along with the etched frogs, have been one of the best investments I have made in building the layout so far. I could not begin to describe the amount of time saved in not filing up frogs and point blades. The blades come from the Stores as a matched pair and, as explained above, have been accurately CNC machined with the correct 3-way planing that is present on the prototype. In the picture above, shown is the blades as they come (top), a single piece of rail with the machining. This piece of rail is then cut in half with a cut-off wheel, and with some cleaning up of swarf and sharp edges left from the machining process, the result is a matched pair of point blades (bottom). The view shown above of the blades shows the side that sits against the stock rail. After some more careful cleaning with needle files, the nose is rounded slightly. Note the planing on this face of the blade. The bit along the topmost edge is done as part of the CNC process, and I have just filed a bit more off the nose. The tip of the blade needs to be quite thin to enable it to fit snugly against the stock rail. At this stage, the blades are nearly ready for fitting, but require a slight bend to make the inside running edge straight. At the 7 foot mark, I carefully bend the blade towards the side of the red arrows so this edge of the railhead is straight. Refer to the drawing below. (Drawing used with permission from Greg Edwards’ Trackwork Manual). Once this is checked against a straight edge, the next step is to test fit the blades in position. The turnouts have been constructed as per NSW practice ie with 16’6” switches (blades). The blade is cut roughly to length, leaving a bit to trim to the exact length. 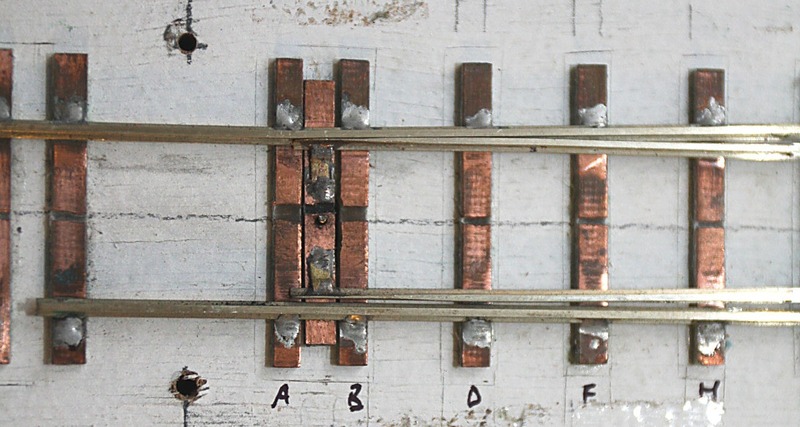 The picture above shows the blade in position against the straight stock rail with a steel rule to check for straightness. The toe must be located slightly short of the kink in the stock rail so when the blade is against the rail, the steel rule should show a continuous edge. The blade length is then trimmed to suit. The example above is pretty close to a perfect fitment of a point blade. 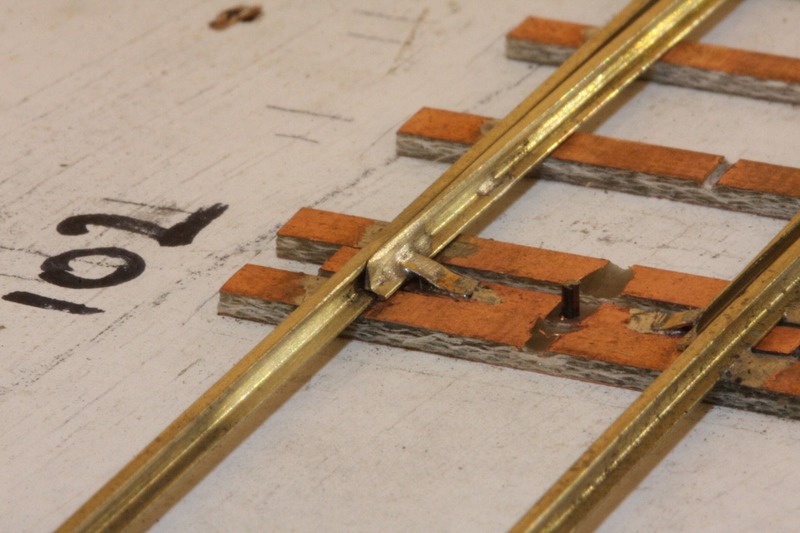 To relieve stress at the hinge joint (heel), I have decided to connect the blades to the closure rails using the Stores’ rail end aligners. These are etched in stainless steel, and I have also used them to join rail sections on the curves in the Down storage yard. In the past, I have just soldered the heel end of the blade to the PCB sleeper, but I think in the long term, a join like this is prone to failure. The blades are now soldered in position at the heel ensuring the toes are sitting slightly away from the stock rail. Before fitment of the throwbar, a hole or slot needs to be drilled in the baseboard to allow for the turnout actuator wire. The next step is to attach the blades to the throwbar. 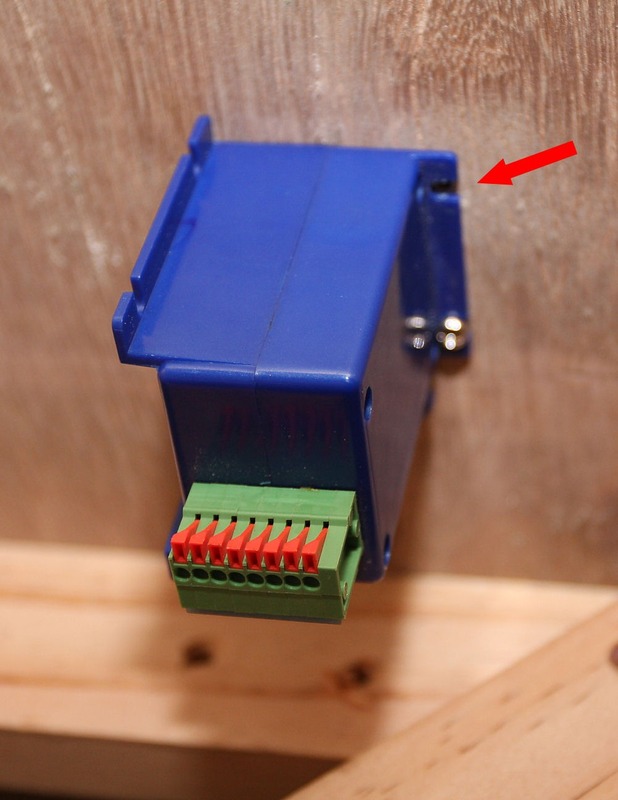 As these turnouts in the storage yards are not meant to look pretty or be prototypically correct in detail, the throwbar is made from thin PCB strip. 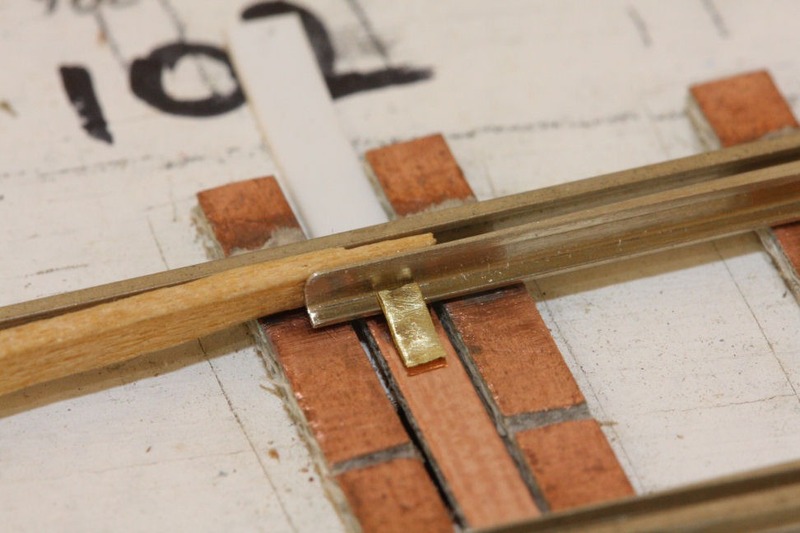 The strip is cut to length at around 23mm. 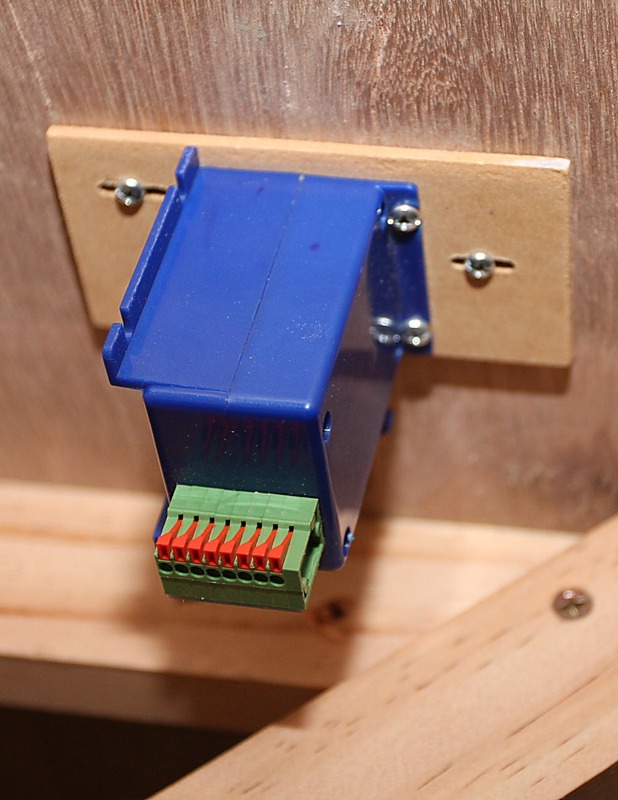 This is placed in position under the blades, centrally between the stock rails. The throwbar needs to be ‘chocked’ against the underside of the stock rail, so when the blades are attached, there is no vertical movement in either direction. 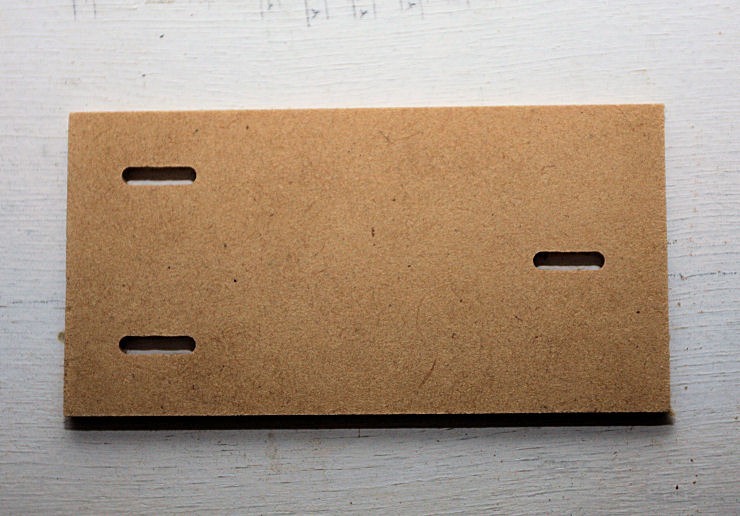 The ‘chocking’ is achieved by packing strip styrene underneath. The blade is now soldered to the throwbar with a small piece of brass strip to act as a brace. You should not just rely on the solder joint from the base of the blade to the throwbar, as there is very little of the rail base remaining to provide a robust joint. (We made this mistake when building the turnouts for Bowen Creek). The other blade is now soldered to the throwbar as well, with the opposite one hard against its stock rail. 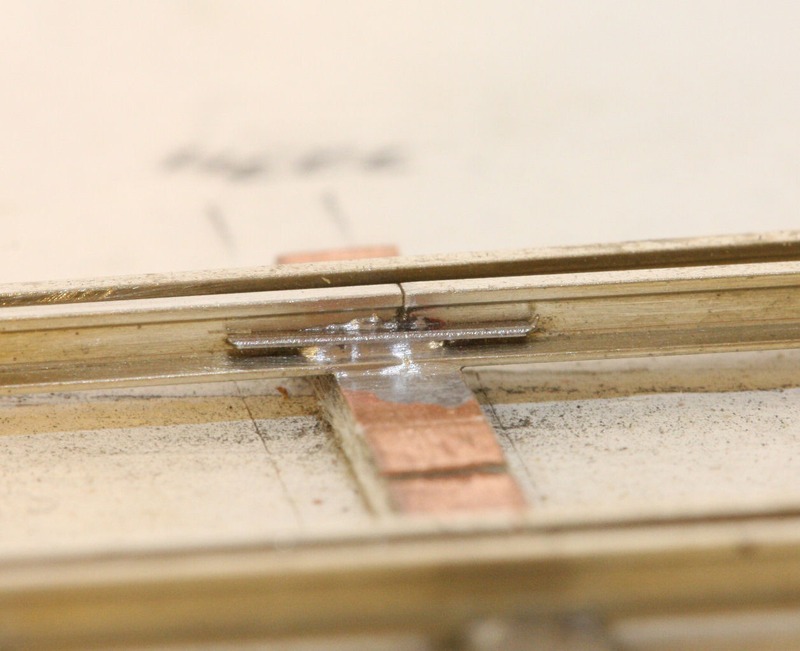 The picture above shows the throwbar PCB in position, the styrene ‘chock’, the brace near the toe and a toothpick in place to set the throw clearance at the toe. This clearance is 4.5 inches on the prototype, and with P87 wheels, this can be achieved in scale. Note in the picture above, the blade is sitting slightly proud of the throwbar and adjacent sleepers. 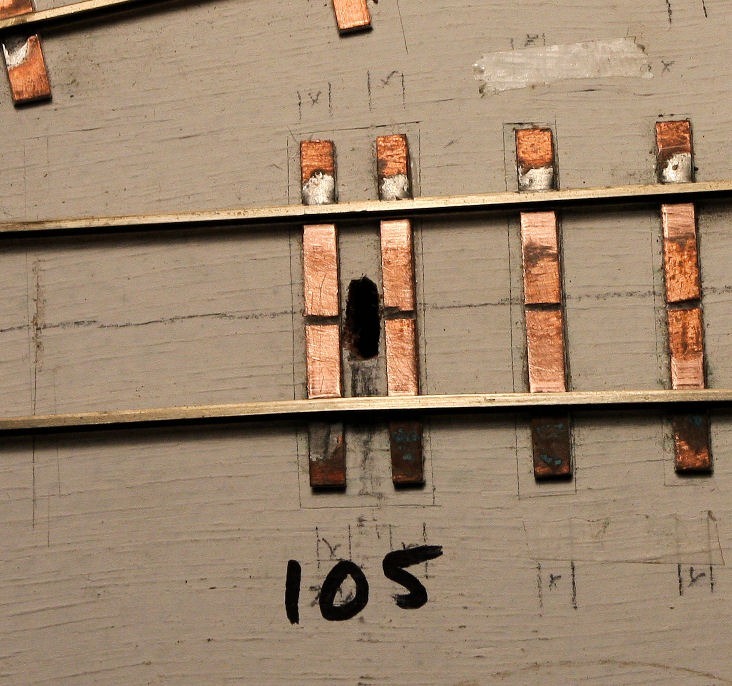 It will be lightly pressed down during the soldering process. Now that both blades are fixed to the throwbar, check its movement under the stock rails. There should be no binding. You could probably use some form of lubricant here. I have used a silicon based spray that will hopefully prevent any future binding. Next comes fitment of the point motor. A hole needs to be drilled in the centre of the throwbar to take the actuator wire. At this stage, the throwbar can also be gapped. So, I decided to mount the motor on a small piece of MDF into which I made three slots to allow for greater adjustment of the motor mount. This was a great improvement. Note the actuator wire and fulcrum is on the rear side of the motor in this shot. OK, we’re nearly done. Just a final few shots showing the completed turnout, set for both roads. At this stage I now run a bogie with P87 wheels through each road and check for smoothness. If there is a slight bump at the nose, use a small needle file to remove a small amount from the top of the nose. The tip of the nose should actually be slightly lower than the stock rail. I have so far completed three turnouts with twenty nine to go!! (that’s not including the ‘scenicked’ ones). I have still to install the checkrails.